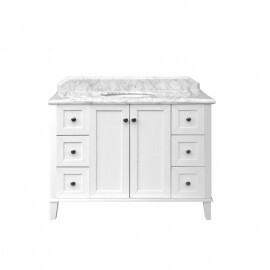 Heritage Style Vanities with Marble Tops A delicate balance of contemporary aesthetics with a heritage "look & feel" combined with strict quality control in the materials used in in its construction, the Coventry range is the definition of "Creating Elegance". The featured highlight of the Coventry range is use of genuine marble tops. Sourced from Europe, they provide the finesse finishing touch in style and elegance. Turner Hastings Heritage Vanities There are 10 products.